Engage experienced Professional Resume Writers to craft out a high impact CV or Resume in the Best Resume Format to target the exact job that you are seeking. We are 100% sure about the quality and cost of our Resume Services. 5: We shall deliver the Final Draft of your Resume or CV within 2 to 5 business days. Check out our Resume Writing Services - Click Here! 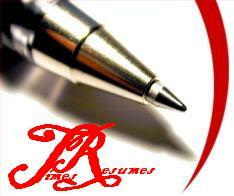 Attempting Resume or CV writing yourself for the first time, can be very scary and time consuming. You may wonder if you have enough to write about yourself to fill one or two pages. You may be wondering just what would be the best format for Resume or CV preparation, that would summarize all of your skills and experience within one or two pages. Get started, ask yourself a few questions about your education, trainings, past employment and your career goals, keeping our targeted profile in mind. If you are unable to do it your self you must consider hiring our expert resume writers to craft out a professional resume or CV for you. Before you even start out to write your Resume or CV, keep in mind the exact reasons why you need to write one. This may really seem simple in the beginning, but it takes more than just wanting to gain employment. You must carefully consider your career objective first. Summarize your goals, specific to the industry, position title, and achievements. Once you have decided on the exact position you are seeking, it can be easier to prepare a Resume or CV that impressively highlights your expertise in the area of your interest. Once you have decided on your career objective, you must do some research on a format for resume writing that is most appropriate for the post and industry that you are targeting. Carry out a search on the Internet or check out relevant books on resume writing, available in the market, to get a better idea of what a well-written resume may look like. Once you have decided on the format that would best suit your industry or field and career objective, use it to get started. You must include your personal information at the top of the CV or resume. Include your name, address, home and/or mobile phone number, as well as your email address. You must confirm that you list an email address that contains your name, as this would help you to appear more appropriate. You can create a free account in "Yahoo", "Gmail" etc. It would be very helpful to have one address listed as a point of contact. Your experiences must be listed out, in chronological order, beginning with the most recent job that you held (possibly the one you are presently working on) and thereafter, and the first must be listed last. The best course of action would be to list not more than five previous jobs you have worked for in the past, and see that your CV does not exceed two pages in length. They must be listed in proper sequential order. You must not skip any of your previous employments or this would create questionable gaps in your employment history. You must avoid gaps in your employment history. These gaps must not reflect in your resume. If you are unsure about this just hire our Resume Writers to create a professional resume for you. When listing your education, in your resume, start with your college degrees, and move to your most recent accomplishments. If you never attended college, you must include all your certifications and courses, in your resume, even if they were taken as training at your previous jobs, which will help in showcasing your qualifications. In terms of skills, list, in bullet point form, all of the abilities that confirm that you are the best candidate for the position that you are seeking. If you are unable to include this in your resume, you must hire Professional Resume Writing Services to create a high impact resume for you. You do not need to list references from your Resume or CV, but, all the same, let your potential employer know that you can provide them if and when asked for. You can include a line at the bottom of your resume that may read: “References available upon request". You can also add a similar line in your cover letter. You must make it a point to ask a friend or a family member or a resume writing expert go through and critically review your Resume or CV, and give you a feedback. Having a second pair of eyes can help you correct any errors, in grammar, spellings or even bring to your attention anything that appears misleading, unclear or confusing. A well-written, error-free Professional Resume or CV crafted out by our expert Resume Writers will help you put your best foot forward and get the job that exceeds your career goals. Finally, a word of advice: Be honest an, don't lie and only present yourself as you are and are truly capable of doing for your employer. If you are still not sure, you must Hire Professional Resume Writing Services today! Professional Resume Writers at TimesResumes will create a high impact, eye catching Professional Resume or CV precisely showcasing your skills, capabilities, experience and educational qualifications. Get a Free Resume review from Times Resumes - Just sent your resume to us via email for a free review by our Professional Resume Writers.